It wouldn’t be an Enthusiast morning-after without a raging case of the drunk creepies and at least a couple angry texts about something we straight don’t remember doing. Come on. Y’all know exactly what we’re talking about. ANYWAYS… so we had some albeit-hazy fun last night and we started our day with brunch at Great Jones Cafe, recommended to us by our dear old friends Hatter and Adina as much for the delicious food as for their liquor license. 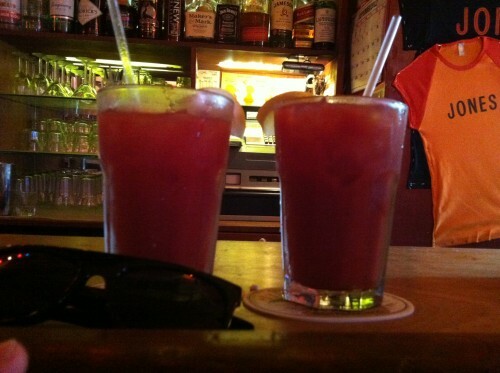 Uncharacteristically early, we enjoyed several hot sauce-doused Bloodies at the bar before our friends arrived and we proceeded to enjoy several more at our table. And also some like, eggs and stuff. We drank Bloodies while experiencing for the first time what waiting on late(ish) friends is like.